The White Plains Public Library is now offering patrons the ability to check out mobile hotspots. The Library hotspot lending program provides access to unlimited, high-speed Internet service anywhere Sprint provides data coverage. Connect up to ten devices at a time, including desktops, laptops, tablets, smartphones, etc. 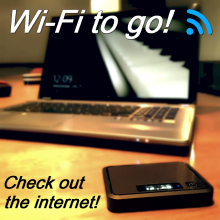 Perfect for those who have no Internet access at home, are going on vacation, or taking their business on the road. Hotspots are available to White Plains Public Library cardholders for a 7 day loan period. Reserve a hotspot now! Hotspots must be picked up at and returned to the Hub desk. To turn on the hotspot, press and hold the power button on the front of the device until you see Welcome appear on the display. It may take up to 30 seconds for the hotspot to be ready for use. Insert the small end of the USB charging cable into the micro-USB charging port on the side of the hotspot and plug the charging adapter into a standard AC power outlet. Make sure that wifi is enabled on your device. Go to the list of available wireless networks and connect to WhiFi-01 (or –02, -03, etc). Enter the password that appears on the yellow label on the underside of the hotspot. Goodbye appear on the display. A Guide to the Mobile Hotspot Lending Program is available here. How do I reserve a hotspot? Hotspots can be reserved online using your library card by visiting our Museum Pass and Hotspot Reservation page. Is there a charge to borrow a hotspot? There is no charge to borrow a hotspot; however, there are fees incurred if the hotspot isn't returned on or before the due date, if they are not returned directly to the Information Desk at White Plains Public Library, and if you reserved a hotspot but failed to pick it up or cancel the reservation at least 24 hours in advance of the pickup date. Who can reserve a hotspot? Valid White Plains Public Library cardholders who are 18 years old or older and whose accounts are in good standing can reserve a hotspot. How far in advance can I reserve a hotspot? Reservations can be made up to 30 days in advance. You can cancel your reservation online by visiting My Passes and signing in with the same card number and PIN that you used to reserve the hotspot. That will lead you to a page where your reservation is displayed along with a button labeled Cancel Reservation. You may also call us at 914-422-1480 and request that we cancel your reservation. Please note that you must cancel at least 24 hours before the pickup date, otherwise you will be charged $10. Where do I pick up the hotspot? All hotspots can be picked up at the White Plains Public Library Hub Desk. Do I need my library card to pick up the hotspot? Yes, you will need to present the library card that you used when reserving the hotspot to pick it up. Can I renew the hotspot I have checked out? No, hotspots are not renewable. Where do I return my hotspot? Return the hotspot to the White Plains Public Library Hub Desk. Do not return it to the bookdrop or to any other library; otherwise, a $50 fee is charged. What is the late fee or replacement fee? The late fee is $50. If a hotspot is lost or damaged, the replacement fee is $100. Will the hotspot work everywhere? No, it will only work where Sprint has data coverage. If you plan on taking the hotspot with you on a trip, you will definitely want to check Sprint’s data coverage map. Enter your zip code (or the zip code where you will be) and click on Map it!, then click on the Data tab just above the map. Also, when it comes to having a good connection to the internet, consider the hotspot to be like a cell phone. If there's a location at home or in an office building where you don't have a strong enough signal to make a call on a cell phone, then chances are the hotspot won't work in that location either. How many devices can connect to the hotspot? A maximum of 10 (ten) devices can be connected at once. Who do I contact if I have questions or a problem with the hotspot?